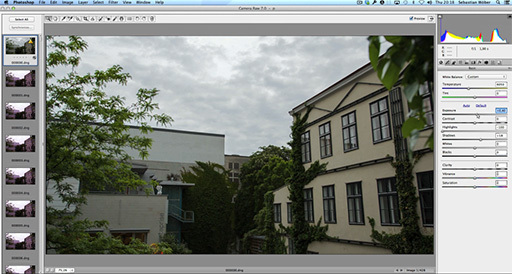 Open the first file in photoshop RAW engine and perform any adjustments. Use the converted image and sync the settings to all the frames. “Save All” to TIFF files. There you go. Pretty straight forward now. Is there an advantage of using Photoshop ACR over Lightroom??? I can confirmthat you can actually import stills sequences direct into Premiere and you are able to skip the extra conversion step required with QuickTime if you want to use FCP.